On New Years Eve, while on a holiday skiing trip in the French Alps, expat Aussie and Clouderati ringleader Sam Johnston wrote a series of tweets exclaiming his anger about a change that cloud accounting vendor Saasu had made to its terms and conditions. earlier this year, a Saasu blog post advised customers that it pricing plans would be changing at the end of the year – nothing unusual in that one would think, companies change their pricing plans all the time, right? In this case however Saasu decided to drop their formerly free plan and introduce a series of new plans, the cheapest of which is $9 per month. 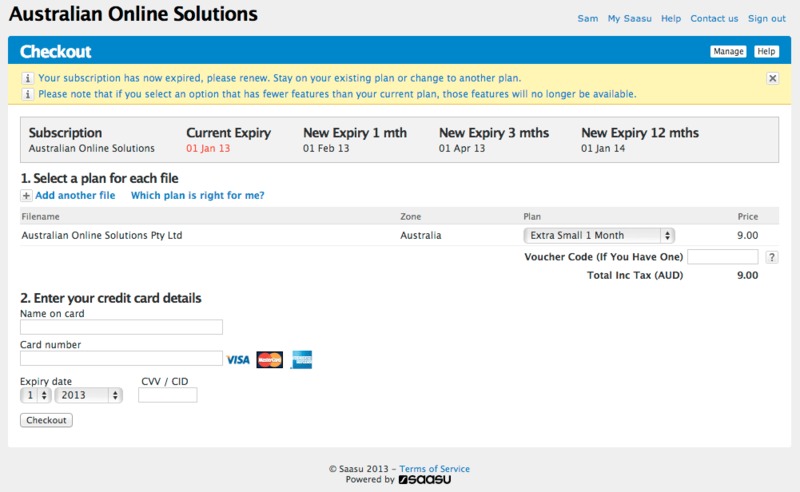 Unfortunately for Johnston, he’d missed the email reminders that Saasu had sent out over the previous few months and when the changes were rolled out, he was locked out of his account since he’d not upgraded to a paid service. While he’s a reasonable guy and would never begrudge a vendor making money from a commercial product, he did take exception to the fact that, in effect, he was locked out of his data and would now have to pay for the privilege of accessing it. The screenshot below is what he was greeted by when he went to do his tax returns in Saasu – in effect he was locked out of his data pending the payment of a subscription. No vendor (or supplier of service to a vendor) shall, in the course of its relationship with any customer, claim ownership of any data uploaded, created, generated, modified, hosted, or in any other way associated with the customer’s intellectual property, engineering effort or media creativity. This also includes account-configuration data, customer-generated tags and categories, usage and traffic metrics, and any other form of analytics or metadata collection. Urquhart believes that, at a minimum, Saasu should have given users who didn’t want to pay for the upgrade the ability to access their data in a read-only way – that way they could see their data, export it to another system or otherwise use it in its raw state, but would not be able to either add any more data or perform any sort of processing on the data retained. As he pointed out to me, the cost of doing this is in fact fairly negligible and it recognizes those who were existing users before pricing plans changed. In fact there is a precedent for this. Paycycle (now Intuit Quickbooks Payroll) keeps accounts in a read only state even after the customer stops paying – this clearly meets the requirements of the Bill of Rights as it guarantees users unfettered access to their data into the future – this is doubly important for cloud software that deals with financial records which, by law, need to be accessible. Of course the Paycycle example is subtly different – it relates to paying customers who stop paying for their account. I would suggest that the onus on a free product that moves to a paid service is in fact higher – users signed up to the service in good faith believing that they would get a continuing service at the functional level they signed up for – unless the company goes out of business, any downgrade to that relationship is a breech of the trust users have in the provider. You can always access your data. You do need to be on a plan for the features you use though. Entering, viewing, printing, emailing and even electronic payroll reports (e.g. to the ATO from Saasu generated files) are all parts of using Saasu and your data as a complete service offering. Hope you can see it from this perspective. That’s a little duplicitous in my mind – if a user needs to pay to see their data, it no longer complies with the “a customers data should always be accessible to them” mantra espoused by Urquhart – and it starts putting a company on shaky ground. Freemium is an interesting strategy, and one which is sometimes fraught with difficulties. Google themselves have come under fire for removing their free version of Google Apps – but there is one marked difference in that case – Google is giving existing customers grandfather rights – anyone who was a customer before Google stopped offering free Google Apps accounts will continue to receive their service gratis – in other words the changes only take affect for new accounts. As Johnston said in closing the debate on this subject – Saasu is a fantastic product that he find eminently useful and will likely just pay for. What’s important here is the principle – users of SaaS have, by definition, less visibility into their product, their data and their vendor than users of traditional software – the onus is on providers to go the extra mile to ensure the vendor/user trust isn’t broken in any way – on this occasion, Saasu should have probably acted differently.